It’s January, so time to come up with a new challenge to write about here on the blog. Preferably something a bit less ambitious than last year’s challenge of cooking a new ingredient a week for a year. The problem with trying out these kind of challenges is that they pre-suppose a certain amount of stability, even staleness, in the lives of the participants. They’re meant to shake things up and challenge the participants. However, last year saw my life get thoroughly shaken up – in a good way! – as I changed jobs and with it, my lifestyle completely changed. From March onwards, most weeks I was just pleased if I managed to cook something reasonably nutritious never mind trying anything new or exciting. All things considered, I’m amazed that I actually managed to try 17 new things, no matter that I got nowhere near my target of 52, just getting near to two new things a month feels like an achievement. Instead, this year I want to cook with two new ingredients each month and try one new recipe a month, as I gained a couple of new recipe books that have been sitting forlornly unloved on my shelf. I’ve even sort of succeeded on the cook a new recipe front already this month! I made tomato soup from an amalgamation of two different recipes this afternoon! I’m once again suffering from the need to cull my store cupboards of excess of cupboard staples so this month I’m trying to do as much bulk cooking from things I already had in the cupboards. So far this month I’ve managed a nice Cauliflower Daal, quesadillas and the aforementioned Tomato Soup. If this last year has proved anything, it’s that if I’m to eat properly and not waste food in this new job, I need to get back to being as organised and pre-planned about my meals as I used to be when I lived at home. Part of the problem is that I don’t keep all my food in the one cupboard, so things are scattered between three different cupboards so I completely lose track of what I do and don’t have in there. This then backfires in various ways from the difficulties caused by discovering at an inconvenient moment that I don’t have an essential part of a particular recipe, or at the opposite end of the scale I bring home several cans of chopped tomatoes that were on special, only to find I already have four cans in the cupboard and nowhere to put them. (Hence tomato soup, which handily used up three cans of chopped tomatoes and a can of butterbeans I’d forgotten why I bought but keep getting in the way at inconvenient moments.) So it’s high time I had a clear out, figured what I do in fact have in there and sat down with the recipe book to figure out what to cook with them before they all expire on me! Hopefully, this will lead me to trying even more things as I actually have cupboard space to fill with new things. Of all the various targets that I set myself this month, the one that has been most unexpectedly successful was my determination to cook more new ingredients. I know there’s no physical way for me to catch up, but I hoped I might actually manage a month that averaged out to a new ingredient each week. And lo and behold I was actually successful! It was a bit touch and go there until the last week of the month, in fact I was properly close to the line with the last ingredient being sprinkled into soup yesterday and today. However, despite a shaky start – I made all the chilli in the world at the start of the month and thoroughly scunnered myself of it – and being away for work part of the month, I managed to take reliable dishes from my repertoire and add a more adventurous twist to them with a new ingredient. I picked these up as an alternative to kidney beans and cooked them much as I would kidney beans, in a veggie chilli. Before cooking they had a similar colour to kidney beans, though they’re smaller and between that and their two-tone colour scheme – that to my eyes makes them look as though they’re bursting out of their skins – they reminded me more of black-eyed beans. Since making dinner with them I’ve discovered that these are in fact the red beans that make up red-bean paste so I feel I really ought to have done something more exciting with them. Perhaps having a go at making chaat or experimenting with a Japanese dessert! As part of my plan to try lots of new ingredients this year, I’ve been picking up all kinds of new and interesting noodles to try. These ones ended up being next on the list for the simple – and expedient – reason that they were due to expire at the end of the month. They’re fine. Much like whole-wheat pasta, I feel they need a bit extra cooking, along with a flavoursome sauce, because they taste similar and I find that a bit discombobulating when eaten alongside a stir-fry. I think my issue with them is that you can taste the whole-wheat, and I associate that with self-declared ‘health-foods’ – the kind of thing you only eat because you know it’s good for you – and tastes like it’s good for you isn’t actually a compliment. Perfectly serviceable but not something I’m likely to bother with going forward. I wasn’t sure how effective this would be, but actually this was surprisingly good. When I don’t have any stir-fry sauces in the house, I make a basic sauce with lime juice, soy sauce, rice wine vinegar, Chinese five spice and a little corn flour. If I’m in a hurry I just chuck a good slug of any two of those give it a good stir and hope for the best. The first time I cooked with Yuzu I just slung some rice wine vinegar and a generous slug of Yuzu into my stir-fry and was really pleased with the result. The Yuzu seasoning I’d bought has a little thickener in it, so was just thick enough that it coated everything and didn’t just end up sizzling in the bottom of the pan. It soaked in nicely to the tofu and the baby sweet corn, giving them a mellow citrusy tang, and while the other ingredients didn’t pick it up quite so well, it left the ghost of a tang in the back of my throat on every bite. Apparently there’s been a bit of a fad for it here among foodies, and I can see why. I look forward to substituting it for lime juice in all kinds of different dishes going forward. I’ve had this for ages and never got round to cooking with it, though the scent has been seeping out the bag and making me hungry whenever I come across it. I must confess that I was prompted to cook with this because I’d been feeling chuffed with myself for having actually tried four new ingredients this month, only to realise that it was only three when I came to write up this post! However when I was making soup (Cauliflower and Leek) I came across my packet of Za’atar and was inspired. I find that Cauliflower can often be a bit bland, unless paired with a strong flavour, which is why I often but it in curries and prefer my cauliflower cheese to be made with a good strong cheese. So I’ve been experimenting with using it to season said soup, it’s taken a few goes to get the right level of seasoning – too little and while it smells amazing you can barely taste it. It adds an extra level of warming to the soup and gives a little extra kick to an otherwise quite plain soup. It’s less of a taste on the tongue and in the back of the throat and the nose, but no less pleasurable for that. I make a Cauliflower and Ras el Hanout Soup, and I think substituting Za’atar for the Ras el Hanout would give it a more mellow flavour. One perhaps more suitable for when I make it for my less adventurous relatives! It’s November, which can only mean one thing – it’s Nablopomo time again. After having got off to a good start to the year here on the blog, life – or work if we’re being entirely honest – has rather got in the way of my food blogging and frankly cooking plans. I’m hoping that Nablopomo will inspire both a return to more regular food blogging and, in turn, more adventurous cooking. I’ve been falling back on old favourites on the recipe front, as I’ve needed bulk cooks that were guaranteed to work and be enjoyed. Also, as I’ve been travelling a lot for work over the summer, I was reluctant to buy new things to cook with, when I might get sent away for work and have my shiny new ingredient expire while I was gone. Which all goes to show why, since July, I’ve barely tried enough new ingredients to count for one successful month. I was quite excited when I spotted these in the supermarket, as I love mushrooms, and like looking out for new and interesting varieties to try in different recipes. I cooked these in stir-fries, curries and even made a mushroom sauce for pasta with them one evening, and to be honest, if I hadn’t known they were different mushrooms, I would have thought they were chestnut mushrooms. So in future I’ll be sticking to their cheaper cousins as they’re not worth the extra 50p per punnet. In my quest for miso paste for my previous attempt at miso ramen soup, I ended up with a box of miso soup mix so I took that as a sign to try it out in it’s intended form. It comes with little packets of freeze-dried veggies – spring-onions and seaweed, which reconstitute in the hot water, but they’re pretty bland and tasteless. Mostly it made me want to experiment with using seaweed in my cooking – it doesn’t have to be this slimy! I’ve come to the conclusion though, that I definitely prefer my miso soup either full of veg or make with soya milk instead of water. However it does make a decent emergency dinner with a wee nest of noodles and a not quite hard-boiled egg. This was a fortuitous contribution to this challenge, as I spotted giant marrows for one shiny pound in the supermarket and couldn’t resist snaffling one. It turns out that marrows are essentially overgrown courgettes, which was something of a disappointment to me, as I was imagining something rather more squash-like and sturdy. That didn’t stop me making soup with it though. I’m not sure the marrow added that much flavour by itself, but my winter vegetable soup was no less tasty for it’s addition. Based on how much the marrow disintegrated when I made soup with it, I decided against making curry with it – other than cutting it in half and stuffing it with couscous, the most popular recipe suggestion for marrow appears to be putting it in thai green curry – I pictured squelchy soggy veg, and I don’t put courgettes in my curry to avoid exactly that scenario. This month I’ve been doing a mini-challenge, not just with food, but with a variety of projects. At the start of July I declared this month, ‘finish the things’ month. I’ve a bit of an unfortunate tendency to start far too many projects and not finish them, and while I’m certainly better at that than I used to be, it’s an on-going work in progress that needs regular stock-taking and attention. Mostly this month has involved finishing half-read books, watching documentaries I have book-marked in tabs and not starting new craft-projects. However, I’ve been trying to do it more generally in my cupboards, which has meant (alongside using up bottles of moisturiser & shampoo with tiny amounts left in the bottom) that I’ve been trying to cook up my cupboards rather than buying more things. As part of my project to re-habilitate beetroot, I’ve taken to keeping one of those vacuum-packs of cooked beetroot in the fridge as emergency vegetables during winter. Quick and easy to use, lasts for months in the fridge. However, you do need to remember to actually use them, as it’s easy to forget about them once the better weather – and greater vegetable availability/variety – returns. Handily I discovered I had some giant couscous needing used up, so I picked up some feta cheese cubes, cropped some spinach from my container garden and made my summer variant of beetroot risotto. However, because I was only making enough to use up the remains of the couscous I was still left with half a packet of – now blended – beetroot. Which prompted the question: what else to make? One of the major challenges that I’ve faced with my ’52 ingredients’ challenge, is that I end up with lots of new things to use up. It’s all well and good finding a recipe to try several new ingredients on, but I end up spending the rest of the month trying to use up the remains of said ingredients. (Most recipes involving tahini only require a spoonful or two, but it comes in a sizeable jar. I got to the point where I tried eating it on toast but that was a decidedly joyless experience so we’ll be giving that one a miss.) Which limits the options for making things with other new ingredients and so we get stuck in a vicious circle. However, while searching for other recipes for beetroot, I discovered a recipe for a selection of Summer picnic dips, one of which involved beetroot. It’s technically called Pink cannellini and beetroot dip, however, I didn’t have cannellini beans in the cupboard but I did have a jar of black-eyed beans. Black-eyed beans and Beetroot dip has a pleasantly alliterative sound, and, I’m pleased to report, a pleasantly mellow flavour. It was a four-fold success. It used up my left-over beetroot before it could go off, it meant I tried a new ingredient (black-eyed beans) and it helped use up one of last month’s ‘new’ ingredients (a generous tablespoon of tahini paste). Which in itself would have been good enough for me, but it was very tasty and I’ve been trying it with various different things for picnic lunches. This month has been quite successful on the trying lots of new ingredients. I managed to try five different ingredients this month – it would have been six but I couldn’t track down konbu powder. As I’ve been averaging one new recipe a month at the moment, I picked out one that included lots of different new ingredients that I either thought I would like or have eaten previously and know I like. White miso and tofu ramen with chilli garlic asparagus, had the advantage of being the kind of recipe that both looks and sounds exactly like something I would love, and has a pretty straightforward recipe. I love Miso/ramen soups but I’m always a little nervous of making my own, at least ones more complex than packet ramen with veggies and protein thrown in. I had a bit of an adventure getting hold of these. The recipe blithely tells you that most major supermarkets stock podded and frozen edamame beans, and while that may be true in the south of England, here in the north of Scotland that is really not the case. I eventually tracked some down in the little Sainsbury’s (who actually proved to be a saviour for the recipe having many of the specific items that much bigger supermarkets did not) in the next town over. They are rather tasty lightly pan-fried as in this recipe, but overall I think I prefer them boiled. I love edamame beans, and I think I might make them a freezer staple as a more exciting alternative to peas. One of my favourite Yo Sushi dishes is a dish that appears to be essentially edamame cooked with sea-salt and spring onions so I fully intend to get myself some sea-salt and attempt to recreate it. Perhaps even with spring onions straight from my garden! I generally prefer Udon noodles when I’m making or eating Japanese noodle dishes – my dad calls them worms, but the thick unctuous texture that puts him off, is my favourite part about them. Soba noodles do however work perfectly in ramen and these ones had a pleasingly whole-wheat flavour that I enjoyed and what worked particularly well in the soup. I can’t speak to how well this does or doesn’t work as a milk substitute, but my goodness it makes a lovely miso soup. I suppose it shouldn’t really be a surprise that soymilk should work really well with soybean paste, but nonetheless it was a pleasant discovery that even before I had added any tofu – there’s a lot of soy in this recipe – noodles or veg it was strangely more-ish. I’ve only ever made miso soup with hot water; perhaps making it with soymilk instead – or perhaps going 50/50 – might be the key to more enjoyable miso soup. Also it has a decent shelf life, so once I have more shelf space I might take to keeping a carton of the cupboard kind for emergency miso soup! My previous experiments with miso paste have been…uninspiring, but even before I put it in the blender to make the larger paste; it had a pleasingly mild taste. (I got some on my hand; I am not a tidy cook.) I still have some left over so I feel much more confident about making a basic miso soup with just the paste, some spring onions and a little tofu. Quick, cheap and easy lunches ahoy! So March was a complete wash when it came to this challenge. I sort of have the excuse of having been sent to another city for work for a week and then having a horrible cold for another couple of weeks but ultimately it’s just proof of my procrastination that I didn’t get any new ingredients tried out last month. So this month I decided to try and get a jump on the month and start things off early doors. And it was a good job that I did, because after that first week of industriousness I didn’t actually manage to try anything else new, despite my best intentions. Pretty much every American I’ve ever known has told me that Mexican food here is not remotely like Mexican food stateside, never mind anything like the food in actual Mexico. So I can’t remotely claim that I know if this is remotely a legitimately authentic Mexican ingredient. However, what it is, is delicious. Not having a high tolerance for chillies I wasn’t exactly going to dump an entire jar over some chicken – or in my case ‘chicken-style’ quorn – as per the jar’s instructions, however I did stick a couple of spoonfuls into my pot of veggie chilli and ended up with a smoky, mellow heat that definitely made me want to experiment with it further. For things other than smoothies, I might add. They actually make a great cheap and easy source of out of season fruit in bleak mid-winter (or as was the case for me, when spring is refusing to spring, you’ve got a lingering cold and a craving for fruit that isn’t apples or tangerines). 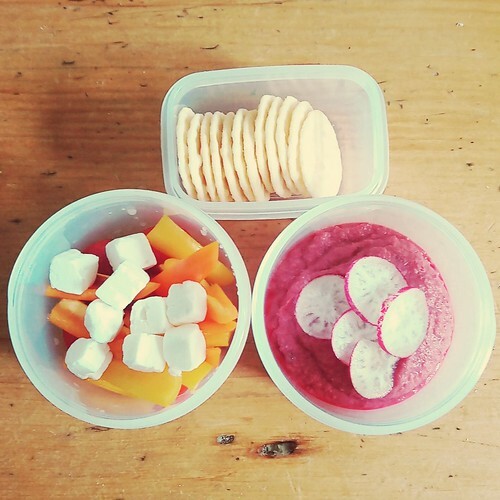 I started making my own little fruit pots back when I started swimming before work, to fend of my muffin cravings, and finding myself on the early shift, I wanted a treat to motivate me through to my breakfast break. I’d made peach yoghurt in my yoghurt maker so I wanted to make the fruit puree with fruit that would compliment it. The frozen tropical smoothie mix proved a lifesaver, I picked out all the mango and pineapple – and most of the watermelon – cooked them down with some ginger, gently mashed them and voila – success! Breakfast was both cheering and tasty. However I was then left with a pile of frozen kiwis – and the remaining watermelon and stray pineapple chunk – that needed used up. Just sticking them in a smoothie seemed like admitting defeat. So instead they will be cupcakes! I know, I know, but do you know how hard it is to find recipes for kiwi fruit that actually involve them being cooked rather than acting as decoration/accompaniment? Many fruitless and frustrating hours were wasted. Despite my best intentions, January was something of an inauspicious start to this challenge. I only managed to cook with two new ingredients. If we’re honest, February wasn’t much better, with once again only two new ingredients being tried. That’s almost a trend, but what it also is, is steady progress so we’ll count it as a win and resolve to do better this month. Mostly during February I was finding new and pleasing ways to use up left-over sour cream – I particularly recommend putting a generous spoonful of it into broccoli soup in place of blue cheese. The problem I’m finding with this challenge is that because I’m only cooking for one person I tend to bulk cook and if you open a jar of something for a recipe it needs to be something that you will use up before it goes off. This was a great success. I tried it in various guises in stir-fries throughout January and evolved a preferred method of using it. Two thirds sauce to one third water makes a good consistency for a stir-fry sauce that coats the rest of the ingredients well. It’s a fairly mild flavour, just strong enough to give your stir-fry an unusual but pleasant flavour, without overwhelming the taste of the constituent parts. A little goes a long way when you’re me, so despite being a fairly small bottle I got quite a lot of dinner out of it. Definitely one to buy again, in a bigger bottle next time. Probably the best thing that can be said about this cheese is that it comes in a tub, pre-cubed and with liquid that is surprisingly effective at keeping it fresh. Unfortunately, as I was using it as a feta substitute – some places do feta in the same way but not many of them and usually I loose about a third of my packet of feta – it is disappointingly bland. This one is a bit of a work in progress. Last year I fell in love with Bubble Tea – hot not cold, and yes, I know, about six years behind the curve – and, on discovering Giant Tapioca at the Chinese supermarket I just had to try making my own. I suspect that my problem is that its not actually the right kind of Tapioca for Bubble Tea because every recipe I’ve followed has turned out poorly. I may have to admit defeat and just make really chunky Tapioca pudding, but in the interim…I still have hope! No, not that kind of coconut milk. I cook with the traditional kind that you get in cans all the time. (Often enough that I know exactly where to go to buy it cheapest and consider it an essential cupboard staple.) This is the milk substitute kind, that you buy in cartons and that is mixed with rice and various other things to turn it into something that works as a substitute for cow’s milk. I’ve been trying it as a milk substitute in various home-made lattes. Particularly in my continuing attempts to master bubble tea. (I tried cooking the giant tapioca in it – that was less than successful.) I doubt it’ll ever replace cow’s milk for me, but it’s a reasonably pleasant substitute if I’m cooking for a dairy intolerant friend, and I prefer it vastly to almond milk. 52 Weeks in a Year, 52 New Ingredients to Try! The New Year is upon us, and with it the time for a new challenge to work on here on the blog. I’ve spent the last couple of years working my way through various recipe books, which has been rather fun, but despite having acquired another two recipe books over the festive season, I couldn’t quite face doing the challenge again this year. So instead I’m going for something completely different. I spotted a challenge a while back that I quite fancy, which is to cook with a new ingredient every week for a year. Knowing the way that my life actually works, I’ll actually qualify that in practice with an aim to cook with 52 new ingredients over the course of the year as some weeks will be too busy to do anything adventurous in the kitchen and other weeks I’ll cook something complicated and adventurous that will require 3 new ingredients. Hopefully that way it will all balance out! A couple of months ago, when I was down visiting my parents, we took a wee trip to the big Chinese supermarket, so I could stock up on the kind of ingredients I struggle to get up here. (Or are just really expensive, the big 100g bag of dried lime leaves I picked up there costs approximately a pound more than a 10g tub of the same from Tesco.) Naturally, I came back with a selection of shelf-stable ingredients to try out that I haven’t got round to yet, so that should give me a head start on the year while I figure out what else I want to try. For the sake of my own accountability they are: Tapioca Pearls – for making my own Bubble Tea, or failing that, pudding – Za’atar – which I need to decant into its own tub as the packet has a slow leak! – along with some Miso sauce and Yakiniku sauce in hope that I can finally figure out some exciting Tofu recipes that aren’t Thai Green Curry.